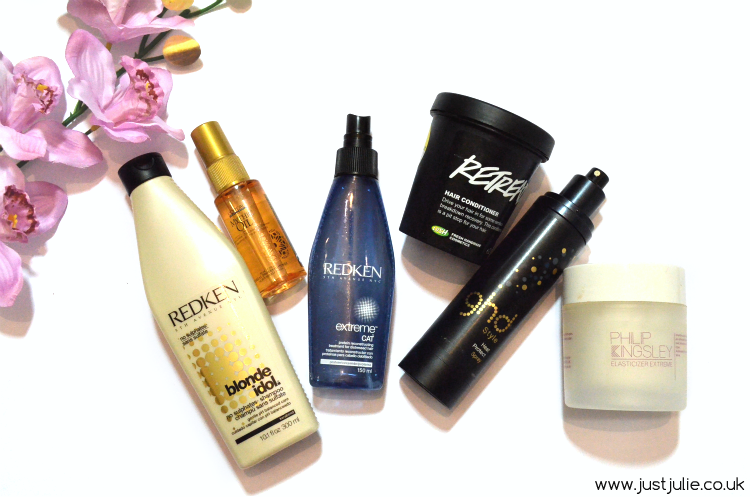 Since I started blogging I'm frequently asked what my hair care routine is. 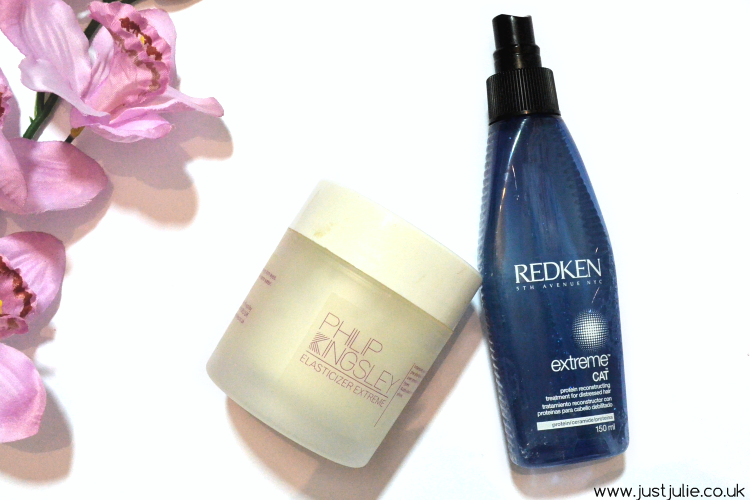 Much like my What I'm Loving | Skincare Routine Post, my hair care products don't change too much. I do try new ones out but I seem to always go back to the same ones, I mean if it's working then why change it right?! Redken Blonde Idol Shampoo - £13.65 As a blonde (obviously not au naturale) I have always struggled to find a shampoo that doesn't strip my colour and make it look dull. 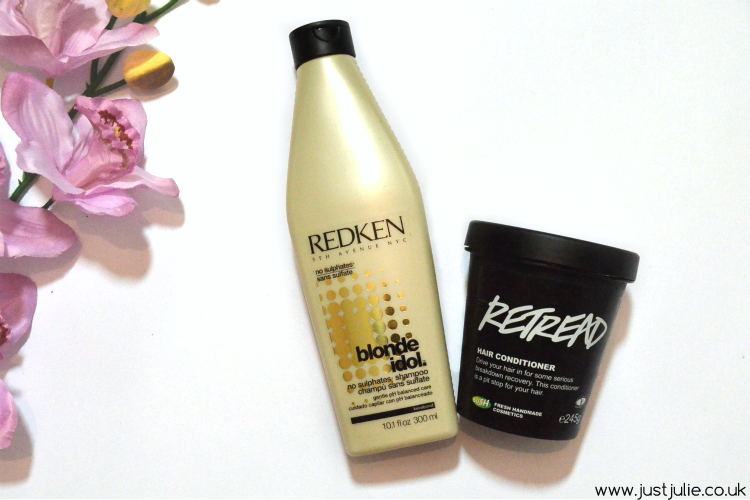 Redken launched their Blonde Idol range last year and I think I ordered the shampoo and conditioner on the same day it launched and have been using the shampoo ever since then. It's sulphate free, which means it really deep cleanses your hair, all whilst being gentle on your colour. I literally love this, my colour has seemed to stay more vibrant since using this. Unlike other blonde shampoos this isn't violet based as they launched the Redken Blonde Idol Custom-Tone Violet Conditioner at the same time, which is a part violet conditioner, which is great too, as it has a dial so you can customise the strength depending on what your needs are. Lush Retread Conditioner - £10.75 I've raved about this conditioner more than once, but you can also read a full review and praise just HERE Since using this the condition of my hair has improved drastically. My hair was seriously damaged from years of over straightening and over processing, and it's taken me a good two years or more to actually get my hair in a good enough condition, where I can visibly see and feel a change and I do put part of that repair down to this little tub! It really deep conditions my hair and leaves it looking and feeling so soft! Another favourite of mine is also the Redken All Soft Heavy Cream which is an amazing deep conditioning treatment that I fully recommend. Philip Kingsley Elasticizer Extreme - £30 Maybe a little pricey for some, but damn the Elasticizer is amazing! If you have dry, damaged hair that is in need of a big boost then this is the product you need. This is a pre-shampoo treatment, damp down hair and then apply a generous amount to your hair. You then leave it on for 15 minutes or longer and then wash it off and shampoo and condition as normal. I tell you, your hair will have this amazing bounce after just one use and continued use just improves your hair even further. This isn't a treatment that will leave a silicone coat to make you think it feels better, this actually works deep within your hair shafts and really does repair and strengthen. I used to use this once a week, but now I tend to only use it once a month just as a top up. Redken Extreme Cat Protein Treatment -£16.55 We should all know that in order to repair and treat hair we need a good mixture of protein and moisture, so using a separate protein treatment is a must have and this is a really good inexpensive treatment, especially as this has lasted me nearly a year! You use this after you have shampoo'd your hair, leave it on for around about 5 minutes, wash off then condition as normal. I was actually recommended this by my hairdresser, as they normally charge £15 for just one use of this in their salon. This really does work to strengthen deep within the hairs core. I was using this once a week, like the elasticizer, but now I use this once every 3 weeks when I feel like my hair needs a bit of a boost. L'Oreal Professionnel Mythic Oil - £15.99 I actually received this in a beauty box, so this is just a deluxe sample size, but this is going to last me a long time as I only use a small amount. I use this after I have washed my hair, before blow drying. This leaves my hair feeling soft and controls any frizz too. I'd say hair oils and serums are probably the products that I tend to switch up the most, but for now this seems to be doing a great job. 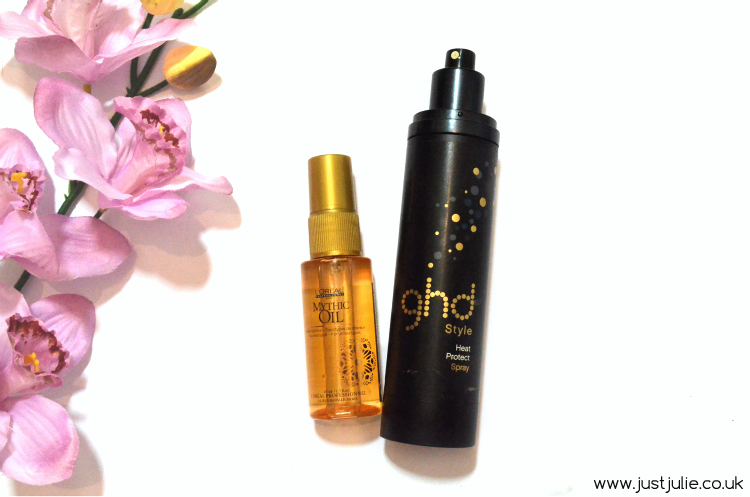 ghd Heat Protect Spray - £9.95* It doesn't matter what great hair products you use if you're just going to use heat on your hair afterwards and not use any form of protection, as you'll just damage your hair further. 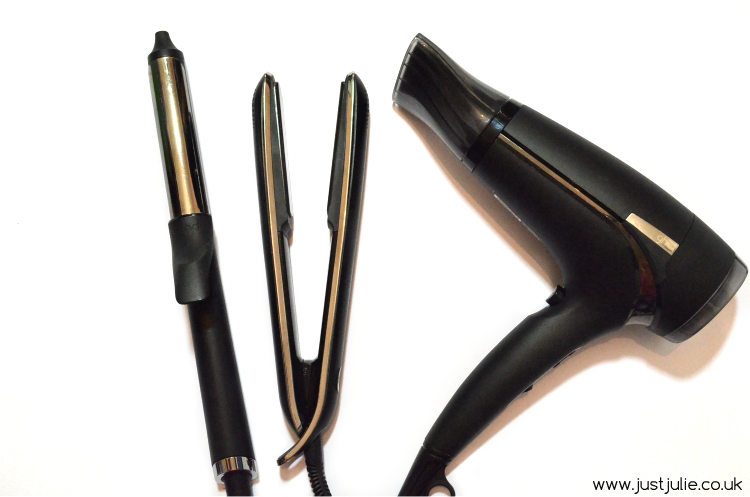 I never used to use a heat protector, which is what played a huge part in damaging my hair in the first place. Obviously working for ghd means I have seen hair in a different way to how I used to. I will not put any heat on my hair unless this is on first! I love that this doesn't leave your hair feeling like it has anything on it, like other brands I've tried in the past. I recommend this daily at work and to friends and I've only ever had great feedback from people after they have used this. Obviously no hair care routine post would be complete without talking about the tools in which I style my hair with. No guesses as to what brand I use every day, well if you see another brand here pretty sure I'd not be doing my job and company any justice! ghd Aura - £145* I always blow dry my hair, and since using Aura (I had ghd Air beforehand, still amazing!) I barely even need to do much with it, as it really does help me to achieve a much straighter and sleeker style, one that only my hairdresser could achieve beforehand with minimal effort. I wrote a full review just HERE so go have a read if you'd like to know more. ghd Eclipse* Before I worked for ghd I never had my own pair and then when I started working for them I was like, right, yeah I see what everyone is talking about now! I could actually straighten my hair so much faster and have the style last longer, much faster and longer than my previous pair that were much hotter!. I've raved endlessly about my ghd Eclipse stylers and also wrote a post about them just HERE so go have a read as these bad boys have changed my hair styling beyond belief! ghd Curve, Classic Curl Tong - £110* Ever since ghd launched their Curve range I tend to mainly rock some form of curl and out of the four in the range, the classic curl tong is normally my go to curler as I can pretty much achieve any kind of style with just this one tong. My curls also last me for days, I'm not even lying, I can get a good 4 days style with this, which means less heat put on my hair and more time in bed for me too! Again I wrote an introduction to the range just HERE so for further details go check it out! So that's my whole hair care routine. It seems to be working for me right now so I honestly don't plan on changing it too much for the time being, that being said, the beauty blogger in me is always looking out for something that's even better, so if I find something that is amazing (or a dud) then I'll definitely let you guys know! Also for those who like to wear hair extensions, I live in them all day long so you can check out my Dirty Looks | Bobby Glam Extensions Review out, which are my current favourite hair extensions. I'd love to know what your hair care routine is and what your favourite hair products are so do let me know in the comments.